Similar to the way new project management software has revolutionized the speed at which project team members communicate, the world of construction jobsite safety continues to advance as well. While the gains made in the A/E/C industries has been profound, this hasn’t changed the fact that construction remains a dangerous profession, and one that still ranks quite high on the list of industries with high rates of fatalities. The good news is that construction companies can now apply the same forward-looking approach to safety with new applications and tools that are designed to reduce risks and keep workers safer. Like a cloud-based project management collaboration tool that cuts down on the need to visit the home office to share documents, new apps help workers find ways to do their jobs without exposing themselves to potential harm. In order to make these improvements, however, your safety team needs to realize the impact of technological breakthroughs that can improve outcomes for all workers. Like adopting a new CRM solution, the benefits of the investment will only be realized if all the key players are on-board. There was a time when the ubiquitous first-aid kit was the most advanced safety asset on a construction jobsite. While it’s still invaluable – and you should absolutely have a modern, upgraded first aid kit at every project site – there are other solutions that can help ensure you don’t have to access the contents of that kit anytime soon. New gear for the jobsite includes tech-enabled devices that give workers more real-time data about potential risks. Obviously, work boots with steel toes have long been a fixture of industrial environments, but some work boots now have steel plates throughout the entire bottom of the sole to prevent injuries caused by stepping on a blunt object. Headgear is also getting smarter, with helmets that can warn workers of dangers in their environment via a heads-up display monitor built into the helmet. Speaking of displays that enhance jobsite safety, did you ever consider how a drone might impact your workers’ security? Drones are affecting many industries, and drone pilots are finding their skills in high demand. Consider using a drone on the jobsite (and training one of your staff members in how to use it safely) to scope out areas that would otherwise require a worker to climb ladders or navigate unstable roof structures. In other words, a drone can go where you don’t want to. 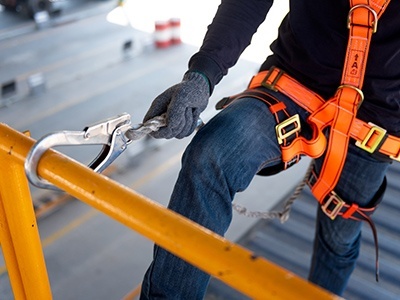 Finally, keeping up to date on safety regulations to ensure you’re enforcing the proper safety protocols on the jobsite helps keep workers safe and ensures your company is in a confident position to answer potential questions from OSHA inspectors or representatives of the communities you’re building in. Technology Can’t Save Us – or Will it? Across the industry, technology applications are increasing the efficiency of jobsites; alleviating pain points in data sharing and file access; spurring mobile workforces that can rapidly solve problems; and providing market intelligence that leads to bigger and better opportunities. The right kind of safety technology can make the difference between life and death. An app that sends alerts if it senses a worker fall would address one of the biggest dangers of the construction industry, while also getting help to an injured worker faster than ever before. Find the right technology for your office or field environment with U-S-I. We’ll provide a free demo and assessment – just contact us today for more information.